The latest generation of the venerable Santos de Cartier was launched only last year, but Cartier added two notable watches to the range at SIHH 2019: the glow in the dark Santos “Noctambule”, and the far more affordable Santos “Large Model” with a gradient blue dial. It’s only a modest facelift but the smoked blue dial works well with the Santos. The dark dial gives the watch, which is quite large and shiny, a more restrained look. But the rest of the watch – which is notably well executed in finish and functionality – stays the same, and remains strong value in its price segment of just under US$7000. 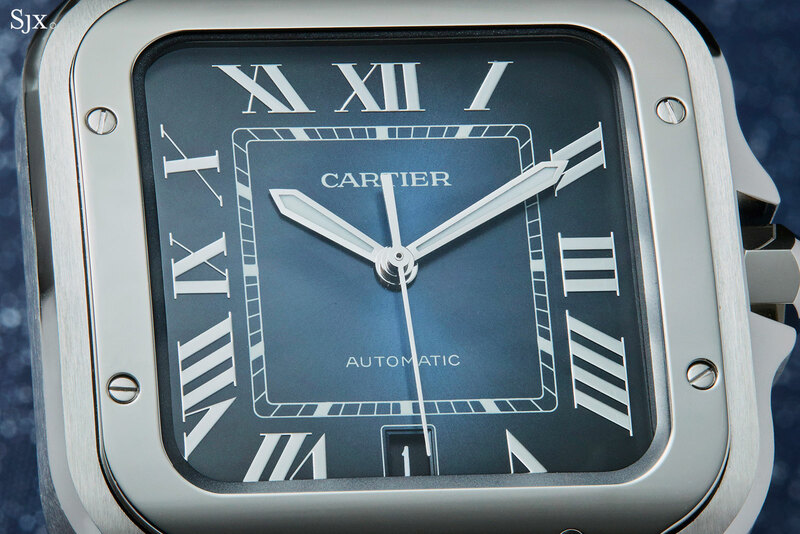 Cartier occasionally installs blue dials on bestsellers, as it did last year with the Ballon Bleu in blue, but most Cartier watches have silver dials – it’s the signature Cartier look – making the Santos in blue quite distinctive, especially for someone who finds the quintessential Cartier look too old fashioned. The blue dial is sportier and more casual than the classic silver dial, while its dark colour helps make the watch seem a little smaller. It’s a good fit for the size and style of the watch. 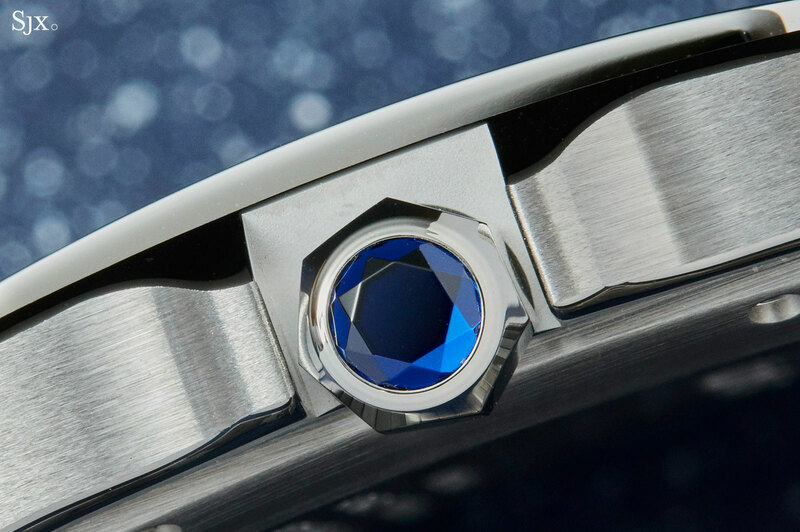 The dial is a muted blue – darker than it appears in most photos – with a graduated tone that darkens towards the edges. Though it has a radial brushed surface, the finish is not obvious at arm’s length. The dial, in short, is fairly restrained on the wrist. Mirror-finished Roman numerals and white markings give the dial contrast, although the combination doesn’t provide the best legibility in some lighting. 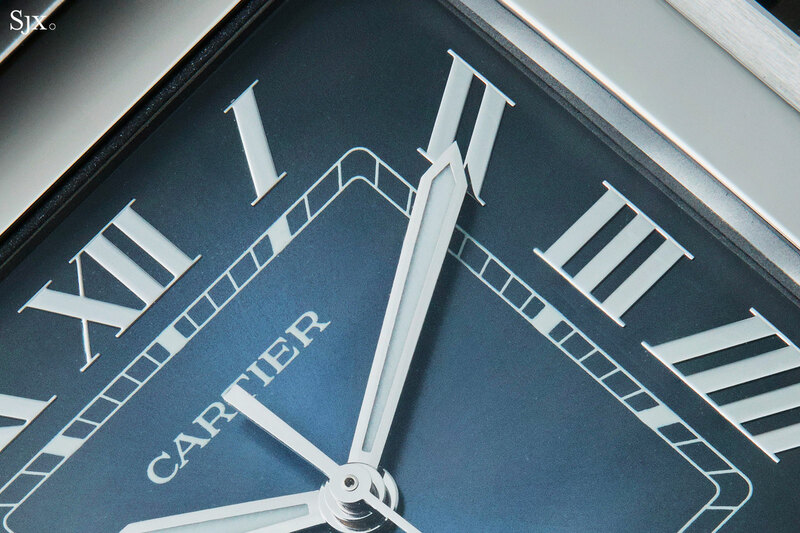 Because of the way the numerals and polished hands reflect light, they sometimes blend into the dial. 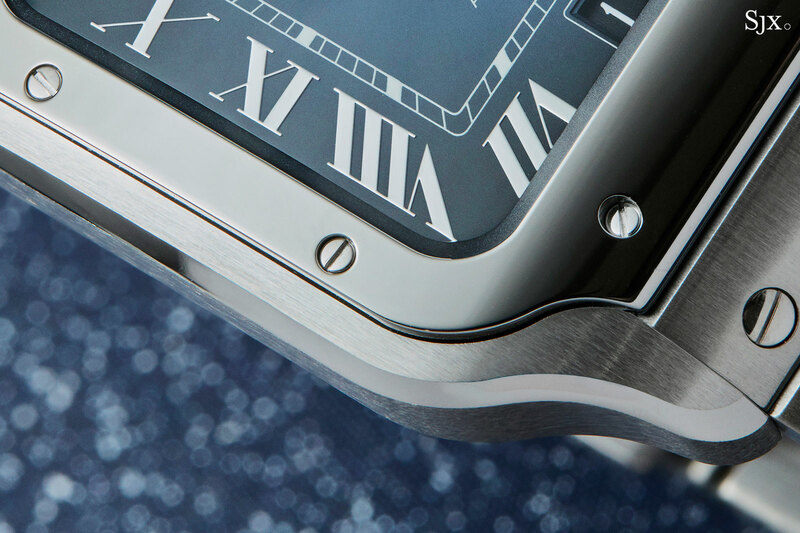 Because the mirrored numerals are formed by a metal deposit on the dial, the “VII” lacks the traditional Cartier “secret signature”. It’s a minor detail, but one that fans of the brand will notice quickly. 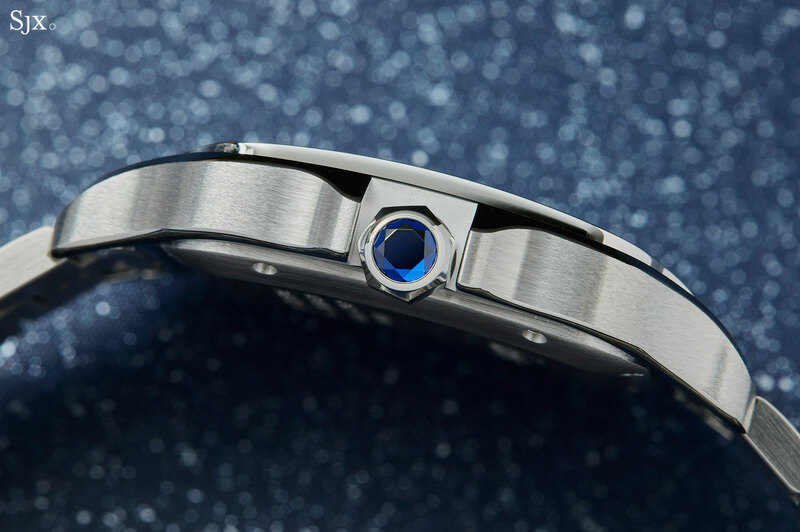 Another detail that is just right is the date display, which has a dark blue date disc to match the dial. 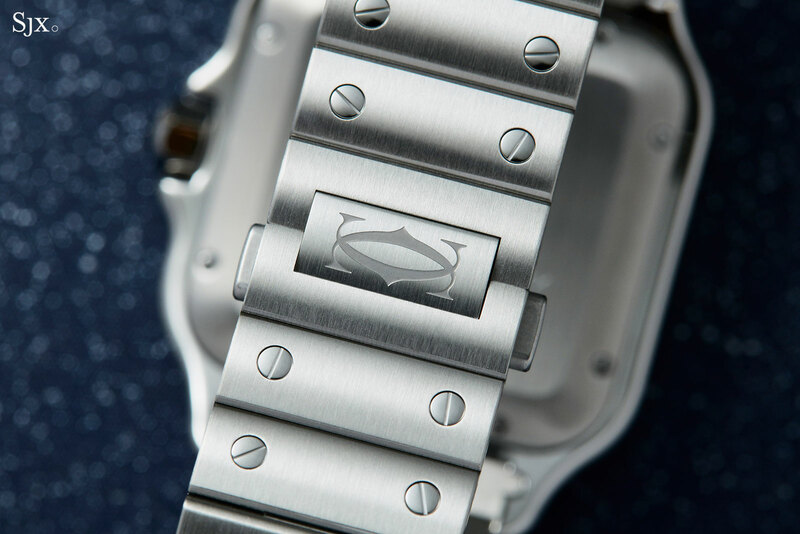 Unusually, the hands are filled with Super-Luminova, unlike the standard model that has blued steel hands. That not only provides nighttime legibility, but also accentuates the casual look of the watch. The rest of the watch is identical to the original Santos de Cartier, which is to say it is well executed in finish and function. It’s a “large model”, meaning the case is 39.8mm wide and 47.5mm long, with a height of 9.08mm. Consequently, it’s a large watch – and looks large on the wrist – but relatively slim, with the curves of the case giving it a fairly sleek profile on the wrist. In short, it makes a statement but wears well. The sleekness is accentuated by the case finishing, which has a linear brushing from top to bottom as well as a wide, polished bevel tracing its outline. Notably, the finishing on the case and bracelet is notably well done for a watch in this price segment. 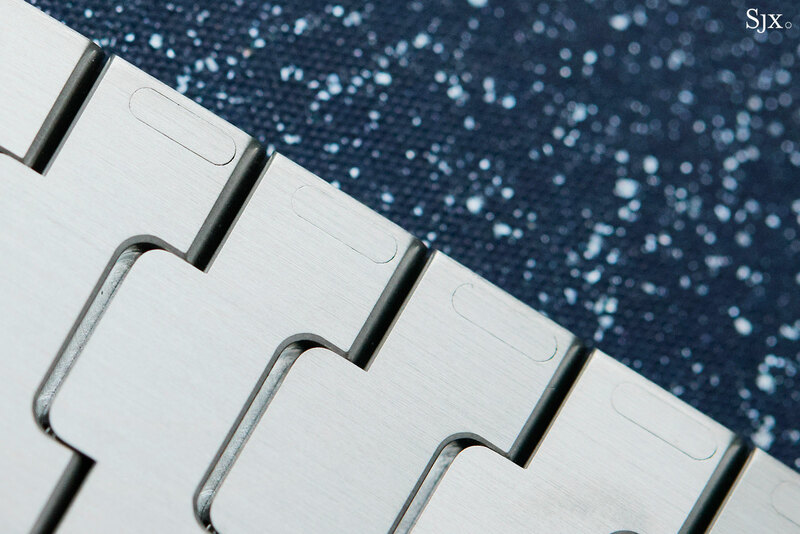 The straight graining on all surfaces is finely done, while the case is polished bevels on both its top and bottom edges. Beyond its aesthetics, the case also boasts two useful features. One is QuickSwitch, a tab on the back of the bracelet or strap that unlocks it from the case, allow for easy swapping. But the flip side of the convenience, which is also the case for all proprietary strap attachments, is that strap options are limited to Cartier, or aftermarket straps with correctly constructed end-links. That means the options might not be as wide, or as inexpensive, as for a watch with an ordinary spring bar attachment. The other useful feature is EasyLink, which is a button on the reverse of each link in the metal bracelet that allows for easy removal. That means the bracelet can be sized with a fingernail, instead of requiring tools. 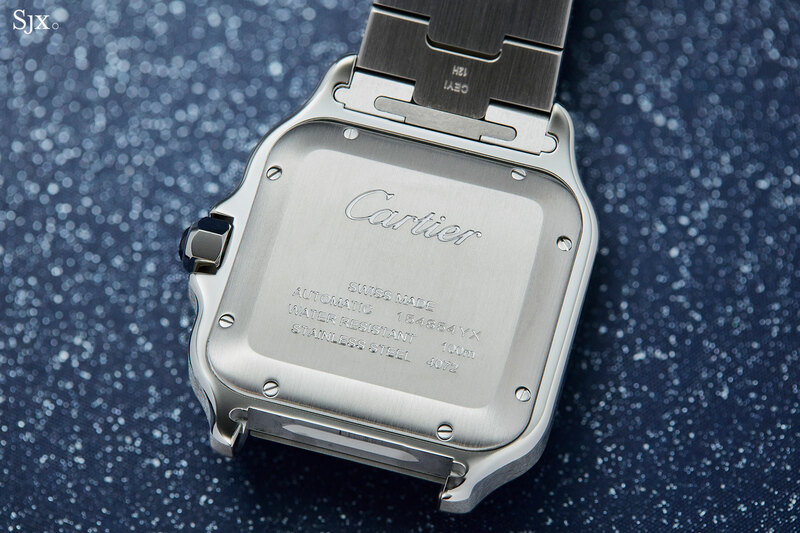 Inside the watch is Cartier’s entry-level in-house movement, the 1847 MC, an automatic with a 48-hour power reserve. 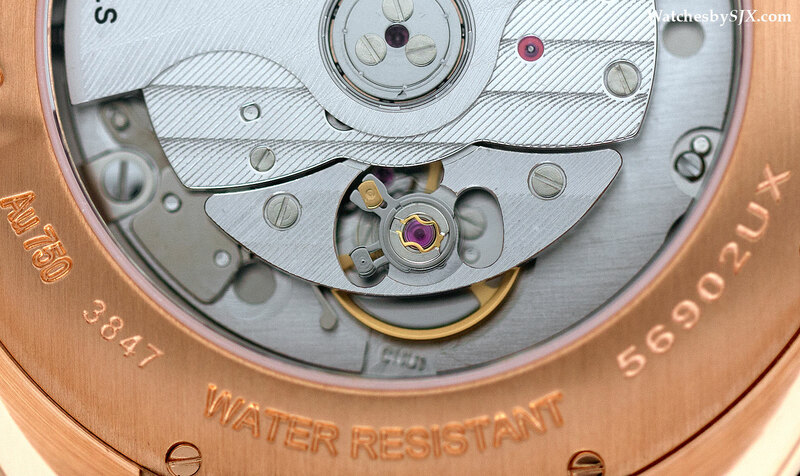 The same movement is found in other Cartier watches like the Clé de Cartier, and visible under a display back. A notable feature of the movement are the nickel-phosphorus escape wheel and pallet fork, which makes them less prone to the influence of magnetism. 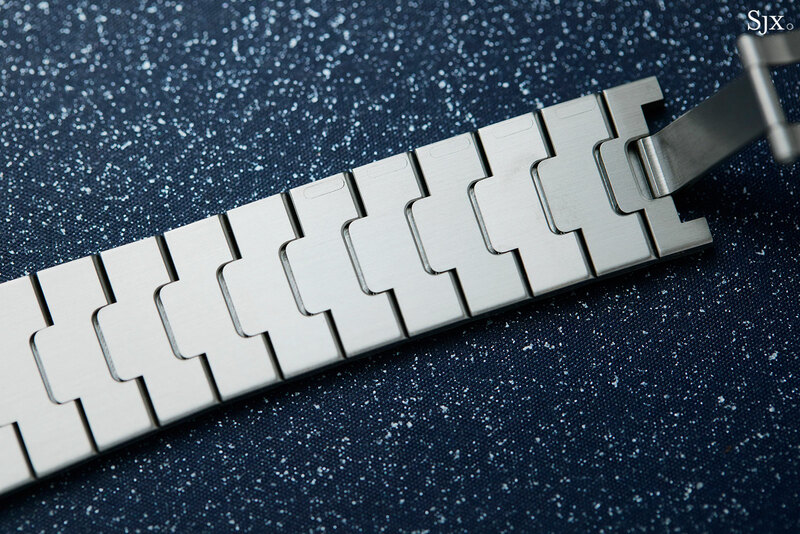 Additionally, nickel-phosphorus parts are fabricated via a high-tech moulding process known as LIGA (and probably produced by Swiss specialist Mimotec), the parts are shaped to extremely high tolerances, improving the precision of the watch. Though nickel-phosphorus parts are fairly common, they are predominantly found in higher-end watches, at least in Swiss watchmaking. Magnetism-resistance is also boosted by a Faraday cage, basically a soft iron ring, that shields the movement from magnetism. Function-wise the movement is well conceived, with the weakness being the relative short power reserve. 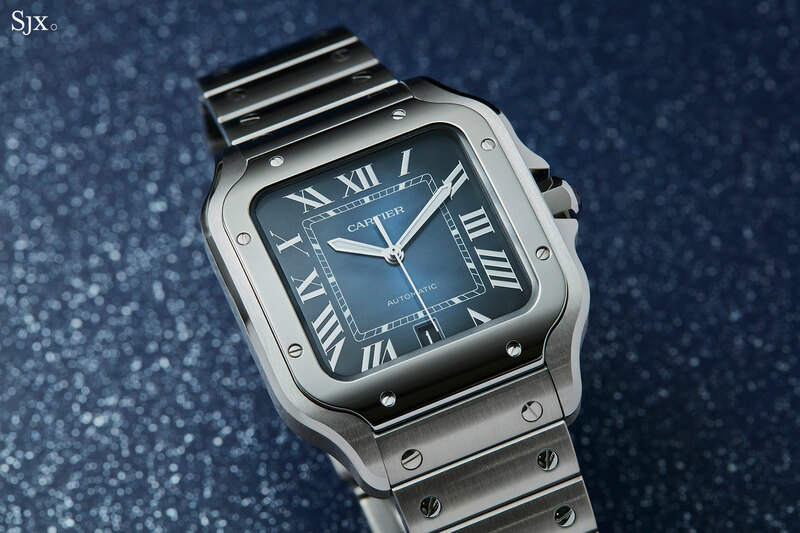 The Santos de Cartier with the gradient blue dial (ref. WSSA0013) costs the same as the standard silver dial model, which is US$6850 or S$9450. It’s already available at Cartier boutiques and retailers. A new look for a classic. 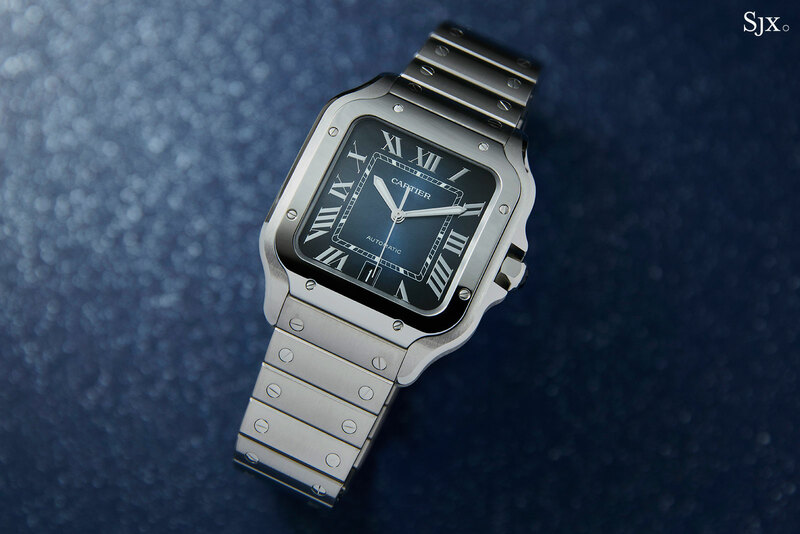 SIHH 2019: Cartier Santos Skeleton ADLC "Noctambule"